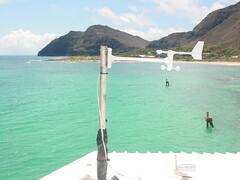 Our long-awaited, much-ballyhooed, but oft-delayed wind sensor at the Makai Research Pier is finally live and online! 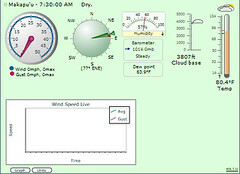 You may access it from the Weather page or from your web enabled phone at phone.windlines.net. The desktop version runs as a Flash applet, if you have the Adobe Flash Player installed on your computer. This applet is LIVE and updates itself with fresh data every 30 to 60 seconds. If you are on a computer without Flash installed, or if you access it using your web enabled phone, you can still view the data as text. The text version is updated every five minutes and must be refreshed manually by clicking the date hyperlink above the weather data. 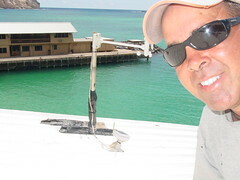 Also, mahalos to Reaper for his roof and ladder work to physically install and align the sensor on the roof. It was HOT, sweaty work being done when I'm sure he'd rather have been in the air. This is our first crack at operating a weather sensor, so I would expect some growing pains. From the experience I've had running the sensor in my back yard, it seems to be quite reliable. If you witness a long lag in data or anything else unusual, feel free to email me or post a comment in the Chatterbox. We may need to restart the sensor's computer for example; something I should soon be able to do remotely, even when Steve is not working. We also intend to add a WEB CAM in the near future, so stay tuned! Well done Jeff, Steve and Reap. Thank you very much. So perhaps the next one should be in Alex's back yard. I suspect that he's close enough to Kahana so the info would be useful. Also, Jeff, would the information you get from the sensor in your back yard be of any help to those thinking of going to Nanakuli? If so would it be possible to gain access to that info? Just wondering. Thanks again. Where I live would be a particularly unreliable spot for wind data. I live directly behind Maili ridge where my house is very, very susceptical to readings that are not indicative of the true conditions. From my window, I can judge cloud base and cloud direction. When it comes down to launch conditions, even I have to drive over to the dump. For the moment, the best resources we have for Nanakuli (besides Doug's experience) are the Nanakuli High School and Nanaikapono Elementary sensors. If the HS only had a web cam, we'd be golden. Alex would be best to opine whether his location would work. I know he's a bit inland though, no? I love iWindsurf, and the Punaluu sensor location is very good but A) it goes down A LOT B) there's a subscription fee to read it and C) see A & B! I wonder if we would be able create another sensor that could co-exist with theirs at the same location? Technically, you can create an entirely self-contained, solar powered, unit that would do everything we need. I've looked into this quite a bit, actually. Unfortunately, making one is significantly more expensive that what we've done at MPU.